I’ve set up this blog in order to hopefully raise awareness of this incurable disease and to let people know how I cope with the disease and to allow others to share their coping ideas with myself and others reading this blog. As I mentioned above it is to hopefully raise awareness of the disease and be a place for people to share their experiences with Lupus. I’m newly diagnosed with the disease at 18 years old and honestly I’m finding it difficult to cope with. I have found so little on the internet about people with Lupus and how they cope, and any forums that I have come across with links to Lupus are old forums that haven’t been posted in or updated in years. It’s an incurable immune system illness, probably genetic in origin and mainly suffered by females. It can affect any part of the body and that’s the danger. AND WHAT IS THE DANGER? Lupus can produce many symptoms and family doctors often fail to recognise it. Meanwhile, a number of major organs can be damaged in an irreversible way. WHICH MAJOR ORGANS ARE LIABLE TO DAMAGE? Principally the kidneys and the skin, also the heart, lungs and brain. CAN LUPUS BE PASSED ON BY DROPLETS OR TOUCH? No, lupus is neither infectious nor contagious. WOMEN ARE THE PRINCIPAL SUFFERERS? Yes – the main trigger of lupus is hormonal activity and change, and lupus can often trigger after childbirth, at the menopause or during puberty and usually between the ages of 15 and 55. BUT WHAT EXACTLY IS LUPUS? In lupus the immune system produces far too many antibodies which, circulating through the bloodstream, cause reactions leading to inflammatory processes anywhere in the body. – I develop a rash, it comes up in little dots and can happen anywhere. 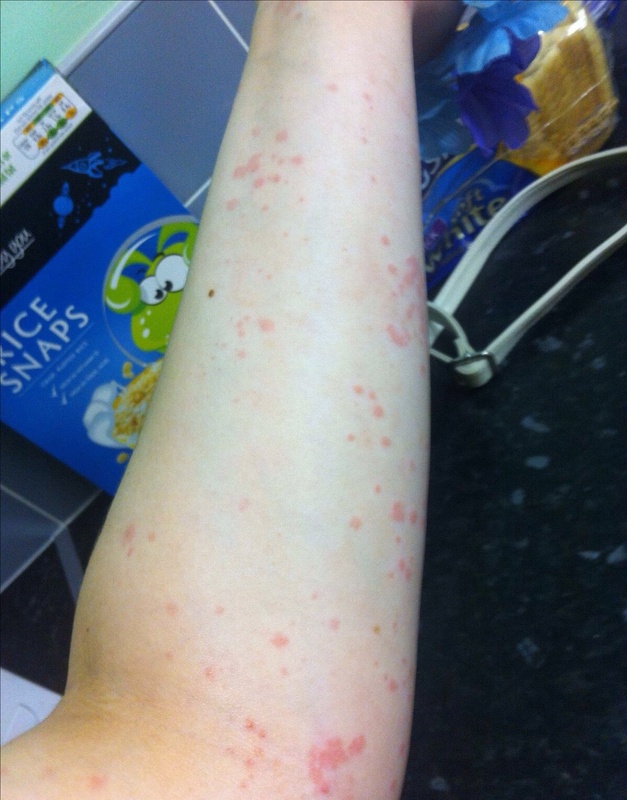 I suffer with this rash from very faint signs of it, to very severe coverage of the rash. – When I get severe coverage of my rash, and specifically if it is on my hips, when I wear clothing and my clothing touches the rash it feels as if my skin is burning. – The rash 90% of the time is not itchy. – I suffer with the rash showing up in little dots every single evening when my pills wear off on my fingers and my wrists. – I take Hydroxychloroquine Sulphate to try and control the disease. – My first signs of the disease was a severe rash with excessive swelling of my fingers. The rash would almost periodically make it’s way towards my finger, then the finger would swell. – The doctors couldn’t understand what was happening to me, at first they thought I had a sprain. When I mentioned that the swelling and pain was jumping from joint to joint (one day it would be in my knees, then my left wrist, then my right wrist) they dismissed me like I was mad and making it up – please be persistent if you feel you may have this disease. You will need to be! – When I get upset, angry or stressed I will without a doubt suffer a bad case of Lupus related joint swelling and pain. – I can no longer bend my right wrist my right wrist forward like I can my left. Since my first flare up, which lead to diagnosis. – I have cried because the pain has got unbearable at points. Rarely, but it has happened. I understand the pain is hard to describe to people around you that are not sufferers. – This disease is VERY frustrating. It does upset me often that I cannot do simple things. Sometimes I can’t turn on a tap or open a door. – I completely understand your situation if you have Lupus. It feels like you are alone as not many people are educated about this disease or understand the impact it has on your life. Below I have provided a photo of the rash that I first started with before my diagnosis two months ago, it is not an itchy rash, to me it just looks hideous. 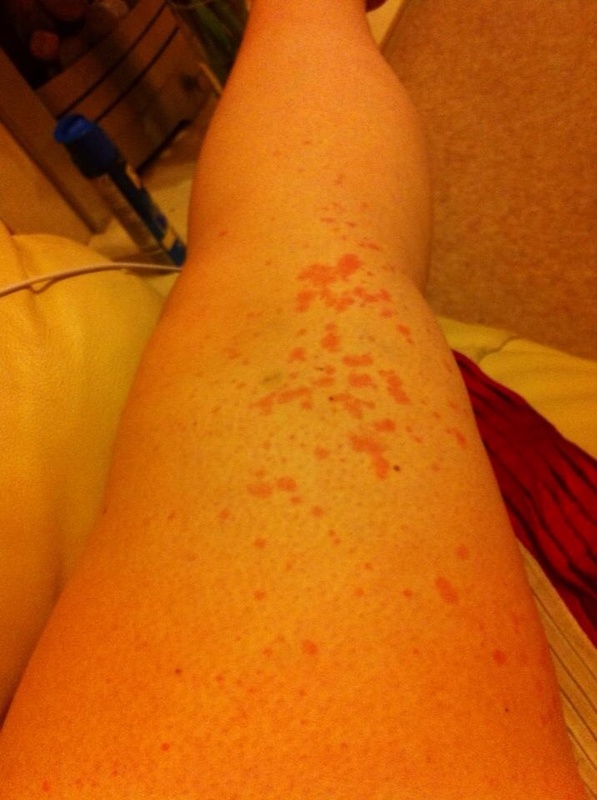 The rash photos are of my hip, leg and arm. I don’t have any recent photos of my rash, I’ll take some when it gets really bad and noticeable. Thank you for reading my first blog post, I hope to post weekly and keep you updated with methods that I use to cope with this horrible disease! Last of all, smile. Be happy. Laugh every day. Pace yourself. Do what you can, when you can. Do not let this beat you. We are unstoppable! Thankyou for raising this petition. I am diagnosed with lupus sle, lupus nephritis, antiphospholipid syndrome, fibromyalgia, dystonia and bursitis. I take a multitude of tablets, medicines and inject daily and though these keep me alive I have to pay… my charges should be over £140 a month! I thoroughly appreciate you getting extra signatures on this petition! You shouldn’t have to pay that much, that to me is simply ridiculous especially when it is something you don’t have any option but to pay if you want to live, dare I say its like exploitation?! Thank you for giving me faith that this blog and petition is worth the effort that I put in! I keep doing the same and lets hope in a year we reach the target!